In the far northeast corner of Tennessee, nestled in the Smoky Mountains, the Tri-Cities of Bristol, Johnson City, and Kingsport became a regional center for mining and industry in the years after the Civil War. Originally founded in 1802 by early settler William King Bristol as a boatyard to ship salt, Kingsport was officially incorporated as a town in 1822. Bristol, which straddles the border with Virginia, was incorporated in 1856, and is perhaps best known as a birthplace of country music. Many seminal figures like Jimmie Rodgers and the Carter Family were drawn to Bristol to record their earliest country sides. Johnson City, founded in 1856 and incorporated 13 years later, emerged as a regional railroad hub. This mountainous area was more shaped by mining than large scale plantation agriculture. Jews were concentrated in the small market cities, though they never developed a large Jewish community. Jews first moved to the area in the 1880s, forming a community that has continued for over a century. Three early settlers helped lay the groundwork for the future development of the Tri-Cities’ Jewish community. Simon Gump, who had come to the United States from Germany in 1844, left Philadelphia for Tennessee in the 1880s after his daughter married Nathan Stern, a Jewish man from Knoxville. Gump opened a clothing store, and his daughter’s family joined them in Bristol in 1884. When the small, but growing Jewish population of Bristol began to gather together to worship, they originally met at Gump’s home. Although he had come from the German states, the birthplace of Reform Judaism, Gump remained Orthodox in his practice. Herman Hecht was also born in Germany, and came to the US in 1890. By 1894, he had moved to Bristol and opened a bakery. While he moved to Louisville temporarily to try his luck in the big city, Hecht moved back to Bristol in 1905 for health reasons. His son-in-law, Max Marks, who had been born in New York, worked as his bakery’s bookkeeper. Hecht also held worship services in his home, though he used the Reform prayer book. In Johnson City, Jews had been meeting informally on the second floor of a store overlooking the town square. Ben Zion Heller, a local clothing merchant, led services for this small group. In Bristol, these Reform and Orthodox groups finally united once there were enough Jews in the tri-cities to support an active congregation. In 1904, they organized B’nai Sholom (House of Peace) and began to meet in a rented room on State Street. The following year, they bought land for a cemetery. Bristol emerged as the largest Jewish community in the Tri-Cities, and so Jews in the other towns joined B’nai Sholom. Jews in Johnson City donated the Torah and ark they had been using to the new congregation. B’nai Sholom hired rabbis to lead services on the High Holidays, while Isaac Levine, a young clothing merchant from England, served as lay leader during the rest of the year. Although it had some members who preferred Reform Judaism, B’nai Sholom was an Orthodox congregation. Most of its early members were immigrants from Eastern Europe. 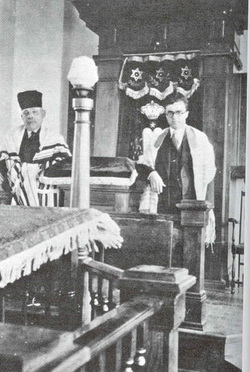 This commitment to Orthodox Judaism made the Bristol congregation different from most other small town Southern congregations, which usually adopted Reform Judaism, which had updated ritual practices, and was more progressive and less strict that traditional observance. Bristol Jews tried to maintain the dietary laws of kashrut, which could be difficult in the mountains of East Tennessee. The closest kosher meat was in Knoxville, over 100 miles away. In 1919, the congregation hired D. Bressler, a shochet (kosher butcher) who also led weekly services. They were also strong Zionists, forming the B’nai Zion Society in 1916, when many other Southern Jews looked with suspicion on the movement. Despite the congregation’s small size, B’nai Sholom employed a series of rabbis during its early years, at a time when the congregation did not even have a synagogue. After Bressler left, they hired Rabbi Morris Hyman in 1920. Hyman had been born in Russia, and moved to Bristol without his family. He lived as a boarder with the local Jewish family of Isaac and Sarah Levine, who had also emigrated from Russia. Perhaps the separation from his family was too difficult to take, and Hyman left after only a year. In 1921, the congregation hired Rabbi S. Frankel, who was paid $100 a month. Frankel started and taught a Hebrew school for the boys of the congregation. An ardent Zionist, Frankel hoped to save his money for an eventual move to Palestine. Frankel led the congregation during a period of consolidation and growth. Jews in Kingsport joined B’nai Sholom in the 1920s. By 1926, they had enough members to build a synagogue. They bought a house and property for $5000, but decided to tear down the house and build a new structure. This was quite a project for the small congregation, which only had about 12 member families at the time. They turned to Jews in other communities to help raise the money for their synagogue. They sent out a fundraising letter asking for financial help for a “Kosher Orthodux shul in the country.” These efforts were successful enough to begin construction on the building. By September of 1927, B’nai Sholom’s first synagogue was completed. Its design was a metaphor of the Jewish experience in Bristol. The exterior was modeled on a classical-style church in nearby Bluff City. While the outside of the synagogue looked like a church, the inside was organized in the Orthodox manner, with a lectern in the middle of the floor facing the bimah and ark. B’nai Sholom’s house of worship, located in downtown Bristol on the corner of King and Goode streets, exemplified the desire of area Jews to fit into their surroundings, while also maintaining their distinctive religion. Reflecting their commitment to Orthodox Judaism, the congregation had an Orthodox yeshiva student from New York speak at the dedication. While the synagogue dedication was a definite high point for the congregation, they soon experienced the hard times of the Great Depression. The economic downturn hit the region hard, and several tri-city Jews moved away to larger cities in search of greater economic opportunity. The remaining members of B’nai Sholom struggled to pay the mortgage on their building. When Rabbi Frankel left in the late 1920s, the congregation was unable to afford a replacement. Facing the prospect of having to sell the synagogue, the members came together to raise money. Ralph Gourse, Tom Green, and Uel Ross played an important role in keeping the congregation afloat financially. The women of the congregation also led the way, holding rummage sales and large fundraising dinners. They would drive to small towns in the surrounding area to solicit funds and membership dues from Jews living there. Finally, the congregation was able to pay off its mortgage. They burned it at a public ceremony that featured a rabbi from Roanoke, Virginia, as guest speaker. In 1937, there were 77 Jews living in Bristol, 55 in Johnson City, and 21 in Kingsport. In 1945, B’nai Sholom had 30 member families. After World War II, the Jewish community of the Tri-Cities began to change. 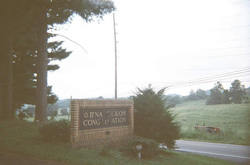 More Jews from the North began to settle in the area, attracted by the city’s growing industry, medical center, and East Tennessee State University. By the early 1950s, members began to discuss building a new, larger home for the congregation. Spurred by a letter from the city of Bristol about a proposed new road that would go right through the congregation’s property, members voted to build a new home. They eventually decided to buy a 15-acre tract of land a few miles outside of Bristol, where they built a community center in 1958. To placate members who opposed the move, initially, services were still held in the old synagogue. By 1960, the congregation held all of its activities in its new community center, which had been named after longtime community leader Armand Hecht. The influx of new people brought together Jews from various backgrounds. Although B’nai Sholom’s membership had always included both Reform and Orthodox Jews, it had remained a traditional congregation. After World War II, calls for change began to arise, and the congregation was forced to navigate a contentious and twisted path toward religious accommodation. For the few years before World War II, the congregation had hosted the Reform Rabbi Jerome Mark from Knoxville twice a month. They hired Isadore Franzblau as their rabbi in 1946. Although he had been raised as a Reform Jew in Europe, Franzblau had earlier served a Conservative congregation in Virginia. Nevertheless, Franzblau alienated much of his congregation when he instituted the Reform Union Prayer Book. Written largely in English, this Classical Reform prayer book was a far cry from traditional Orthodox services. When a group tried to remove him in 1952, his defenders cited how much activity he had brought to the congregation and argued that “rabbis do not grow on trees.” For a congregation the size of B’nai Sholom, hiring and maintaining a rabbi could be difficult. Nevertheless, Franzblau was forced to leave the congregation in 1953. Three years later, they hired a Conservative rabbi, Seymour Atlas, who had been pressured to leave his previous pulpit in Montgomery due to his support for the burgeoning civil rights movement. Atlas sought to institute Conservative Judaism in the unaffiliated congregation. He encouraged the members to make the kitchen in the new community center strictly kosher, which was approved by a narrow vote of 34 to 33. Since these strict rules prohibited congregants from bringing their own food to the synagogue, they soon relaxed the restrictions to simply ban pork from the synagogue. Rabbi Atlas eventually resigned over the issue. Rabbi Pierce Annes came in 1959, and convinced the congregation to affiliate with the United Synagogue, the national organization of Conservative Judaism. B’nai Sholom eventually built a parsonage on their property so their rabbi would not have to drive on Shabbat. In the late 1950s, B’nai Sholom was flourishing, with a new building, a religious school with 60 children, an active Sisterhood, and a popular Young Judea chapter. The congregation reached a peak in 1960, with 62 member households. In the 1960s the Tri-Cities Jewish community began to decline as most children raised in the area did not return after college. By the end of the decade, they were having problems getting the requisite ten members for Shabbat services, and began to institute a “Minyan Club,” in which members were assigned particular nights to attend synagogue. By 1972, their membership was down to 44, and their religious school enrollment had dropped to 16. They could no longer afford a full-time rabbi. In many other Southern Jewish communities, once population decline began in the 1960s, it continued unabated. The Tri-Cities had a different story; the Jewish community experienced a resurgence in the 1970s and 1980s. 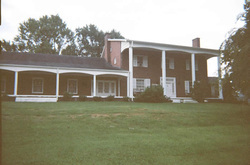 Jews were increasingly drawn to Johnson City, which had emerged as a regional medical center and was home to the growing East Tennessee State University. Jewish doctors and academics were replacing the Jewish merchants of previous decades. By 1980, B’nai Sholom had grown to 70 member families, and 210 Jews lived in the Tri-Cities. When a tornado severely damaged their building in 1977, they quickly rebuilt it. They also became more assertive in the community. When a Palestine Liberation Organization official was invited to speak at East Tennessee University in 1978, a majority of congregation members protested outside, even canceling Simchat Torah services to do so. In 1996, B’nai Sholom hired an area Reform rabbi to serve the congregation part time, along with his wife, who was a cantor. When they left in 1999, three members established a rabbi endowment fund to pay for a full-time spiritual leader. In 2000, they hired Rabbi Brian Nevins-Goldman, a Reconstructionist rabbi who served the congregation for six years. Rabbi Arthur Rutberg took over as full-time rabbi in July of 2015. Over the years, B’nai Sholom has been a mirror reflection of the Tri-Cities’ Jewish community. In its early years, it was made up of European immigrants who adhered to the traditional practices of the old country. Over time, the members acculturated to life in eastern Tennessee, and had to negotiate how much to alter the congregation’s religious rituals. As more Jewish professionals settled in the area after World War II, replacing the Jewish merchant class that was largely fading away, the congregation adopted more inclusive religious practices. One constant factor has been their relative small size, which has forced Tri-City Jews to compromise over their religious differences. This cooperation has been successful for over a century, as B’nai Sholom and the Jewish community of the Tri-Cities continue to flourish today.